Tel Arad is an Iron Age city in the Negev desert. 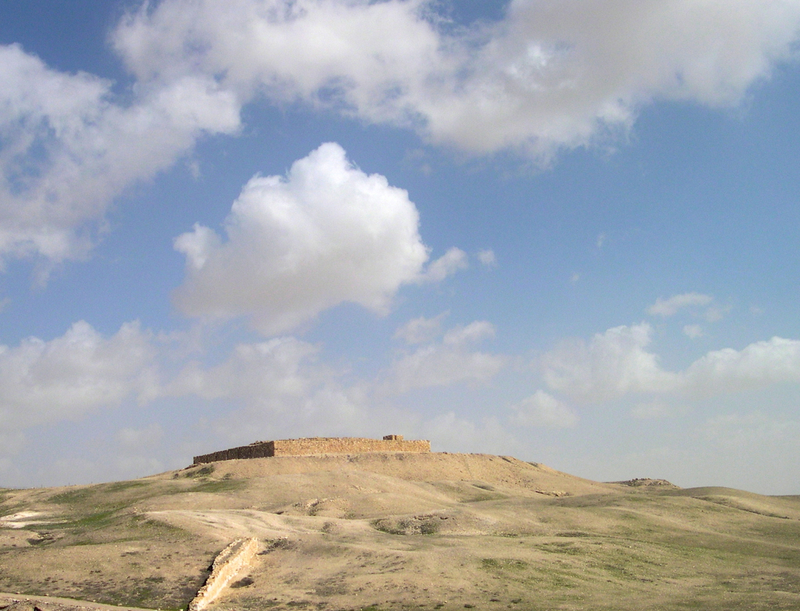 This week’s photo is of the ruins of a major fortress built on the top of the hill to protect Israel’s southeast border and the Negev trade routes. In the northwestern corner of the citadel, an Israelite temple with three rooms was discovered, made up of an ulam (entrance hall), heichal (main hall), and dvir (holy of holies). Stone altars for incense flanked both sides of the entrance to the dvir. In front of the temple was an altar built of bricks and stone, measuring 2.5 x 2.5 meters, similar to the altar described in Deut. 27:5 and II Chronicles 6:13. This temple was destroyed, apparently as a result of the religious reforms of King Hezekiah at the end of the 8th century BCE. The technical details – the photo was taken in December with a Nikon point and shoot camera (ISO 100, 8mm, F7.6 at 1/359 sec). This entry was posted in Archaeology, Desert, Photography and tagged Hezekiah, Negev, tel, Temple on June 23, 2013 by Shmuel Browns. Today is the fast day of 17 Tammuz where we remember the breach of the walls of Jerusalem. Less than a month later on the 9 Av the Temple was destroyed. A silver half shekel coin was discovered at the Emek Tzurim National Park during the sifting of rubble from the Temple Mount dumped by the Waqf in the Kidron Valley. The coin, weighing 7 grams, is from the Great Revolt against the Romans (66-70CE). 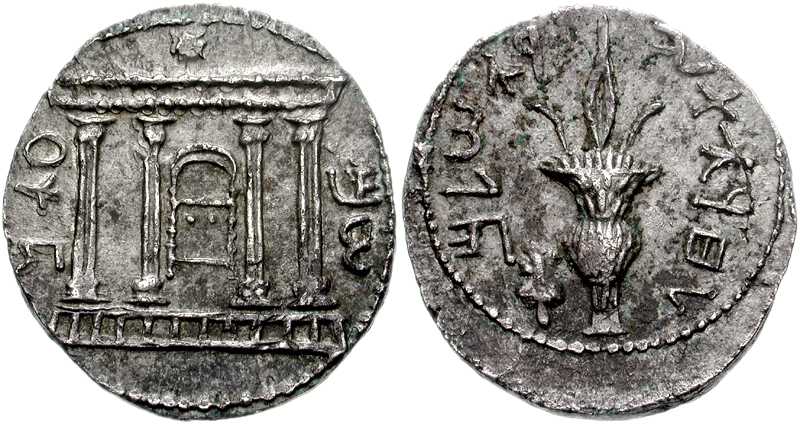 A branch with three pomegranates and the words “Holy Jerusalem” appear on one side of the coin, while the words “Half Shekel” appear on the other, in proto-Hebrew script. The use of Hebrew (and not Jewish Aramaic that came into wide use during the Second Temple) and proto-Hebrew script is popular on Jewish coins from that period. During the period of the Great Revolt, they replaced the Tyrian shekels for the annual half shekel tax that every Jewish male adult gave to the Temple treasury and Jerusalem. A Babylonian arrowhead was also discovered in the sifting of archaeological rubble from the Temple Mount. Only a small number of arrowheads from the 6th century BCE, the period of the destruction of the First Temple, was found as it was Babylonian army practice to gather up the used arrows. Arrowheads were found close to the top of the City of David hill, in the Jewish Quarter of the Old City and in Ketef Hinnom evidence of the heavy fighting. Today is very appropriate to see the multi-media presentation about this period at the Burnt House in the Jewish quarter in the ruins of a house destroyed during the Great Revolt. This entry was posted in Archaeology, Jerusalem and tagged arrowhead, artifacts, half shekel, silver coin, Temple on July 8, 2012 by Shmuel Browns. Yesterday evening marked Tisha b’Av, the 9th day of the Hebrew month of Av, which commemorates the destruction of the Temple built by King Solomon and destroyed by the Babylonians in 586 BCE. The Babylonians razed Jerusalem and exiled the Jews from their land. But Babylon fell to the Persians shortly thereafter and Cyrus, the Persian king gave permission to the Jews to return and rebuild the Temple. So a remnant of the Jewish people came back to Jerusalem from the Babylonian exile 50 years later and built the Second Temple, a much more modest structure. A young person living in Jerusalem could have seen the splendor of the First Temple, lived through the Babylonian exile and seen the Second Temple. Almost 500 years later, King Herod built four stone supporting walls around the Temple Mount and filled the area with earth and a series of arches to expand the quadrilateral platform (about 250 meters on each side); the longest supporting wall is 488 meters long. Herod rebuilt the temple, a magnificent structure, decorated with gold and marble that stood 50 meters high. Even the Rabbis who were not great fans of Herod record that “whoever has not seen Herod’s Temple has not seen a beautiful building in his life” (Baba Batra 4a). Herod built a main street with a drainage channel underneath that runs along the length of the western wall and at the southern end a staircase that begins parallel to the street and crosses over the street (like a highway interchange) that led to the Royal basilica; today the remains of the vault that supported the staircase is known as Robinson’s Arch. The same street continues south all the way to the Siloam Pool. The Romans destroyed the Temple and Jerusalem on the 9th of Av in 70CE. The supporting walls of the Temple Mount are standing to this day and you can walk on the 2000 year old Herodian street and see the large ashlar stones with their signature frames in a pile from when the Romans pushed them off the top of the wall. I sat on the paving stones of the street yesterday evening to read Eicha (the book of Lamentations) and remember the destruction and our return. Yesterday the Israel Antiquities Authority announced two new finds in a press release. A 2,000 year old iron sword, still in its leather scabbard, was discovered in work the Israel Antiquities Authority is doing in the channel, which served as a hiding refuge for the residents of Jerusalem from the Romans at the time of the Second Temple’s destruction. In addition, parts of the belt that carried the sword were found. Roman sword made of iron used by soldier stationed in Jerusalem in 66CE. Photo by Clara Amit, Israel Antiquities Authority. 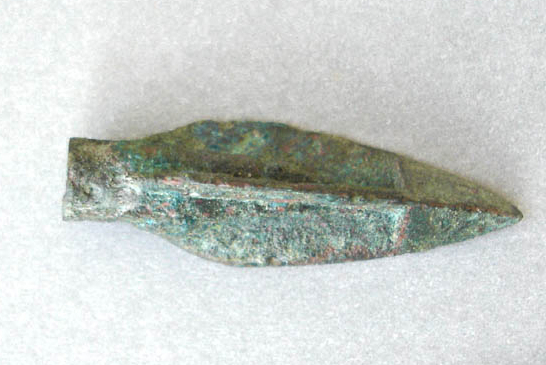 According to the excavation directors Eli Shukron of the Israel Antiquities Authority and Professor Ronny Reich of the University of Haifa, “It seems that the sword belonged to an infantryman of the Roman garrison stationed in Israel at the outbreak of the Great Revolt against the Romans in 66 CE. The sword’s fine state of preservation is surprising: not only its length (c. 60 cm), but also the preservation of the leather scabbard (a material that generally disintegrates quickly over time) and some of its decoration”. A stone object adorned with a rare engraving of a menorah was found in the soil beneath the street, on the side of the drainage channel. Stone inscribed with five-branched menorah. Photo by Vladirim Naykhin. According to Shukron and Professor Reich, “Interestingly, even though we are dealing with a depiction of the seven-branched candelabrum, only five branches appear here. The portrayal of the menorah’s base is extremely important because it clarifies what the base of the original menorah looked like, which was apparently tripod shaped”. The fact that the stone object was found at the closest proximity to the Temple Mount to date is also important. 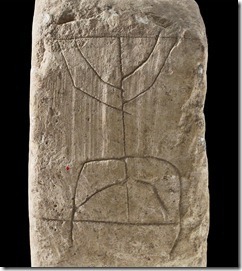 The researchers suppose a passerby who saw the menorah with his own eyes and was amazed by its beauty incised his impressions on a stone and afterwards tossed his scrawling to the side of the road, without imagining that his creation would be found 2,000 years later. This entry was posted in Archaeology, Jerusalem and tagged candelabra, Davidson Archaeological park, drainage channel, Herodian street, menorah, postaweek2011, Temple on August 9, 2011 by Shmuel Browns.